The Trial Before Christmas 2013 generated news around the world, at local, regional and national levels. Notable reporters covering the case included: Pete Williams, justice correspondent for NBC National News; Joanne Kaufman, of the Wall Street Journal; and Jimmy Vielkind, of Capital New York — a media property of Politico. Other major outlets included mental_floss magazine, FindLaw, New York Law Journal, and Brownstoner. An article by the Associated Press was syndicated by hundreds of local tv stations, radio news programs and newspapers across the country. On-site television coverage by WNYT News Channel 13 and Time Warner Cable News was also syndicated across the nation by local affiliates. One local print journalist was inspired to report on the proceedings in rhyming meter. 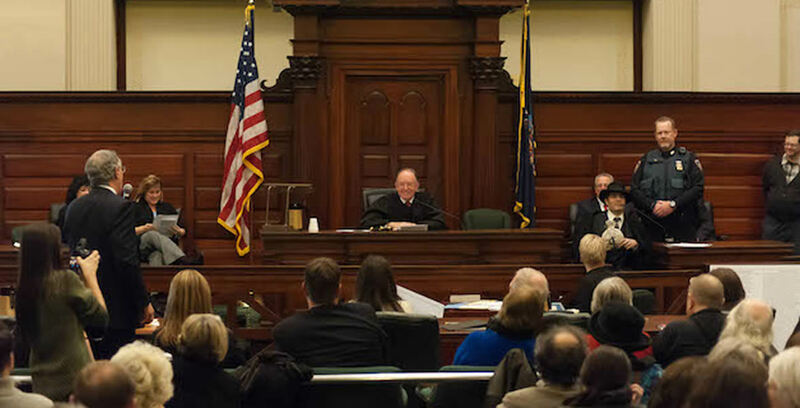 “NY mock trial for ‘The Night Before Christmas’,” Associated Press, December 17, 2013 (syndicated in 100s of TV, print, radio and online media outlets). “‘Twas a night with no verdict: Mock trial to decide who the classic poem ends in hung jury,” by Bryan Fitzgerald, Times Union, December 19, 2013. “Livingston v Moore: The Trial to Decide Who Wrote ‘A Visit From St. Nicholas’,” by Stacy Conradt, mental_floss, December 19, 2013. “Will the real author please stand up! Livingston vs Moore, Round One.” By Don Rittner, December 19, 2013. “Christmas poem authorship’s mock trial ends in hung jury,” Poughkeepsie Journal, December 20, 2013. “‘Night Before Christmas’ Trial: ‘Twas the Verdict Surprising?” By Jenny Tsay, Esq., FindLaw, December 20, 2013. “A Case of Naughty v. Nice?” by Joanne Kaufman, Wall Street Journal, December 23, 2013.